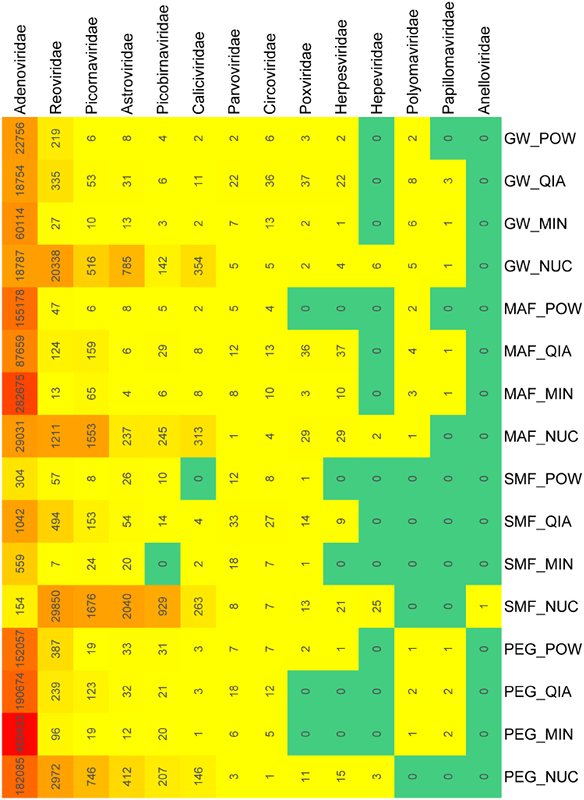 Evaluation of Methods for the Concentration and Extraction of Viruses from Sewage in the Context of Metagenomic Sequencing. PLoS ONE, 12(1): e0170199, 2017. Viral sewage metagenomics is a novel field of study used for surveillance, epidemiological studies, and evaluation of waste water treatment efficiency. In raw sewage human waste is mixed with household, industrial and drainage water, and virus particles are, therefore, only found in low concentrations. This necessitates a step of sample concentration to allow for sensitive virus detection. Additionally, viruses harbor a large diversity of both surface and genome structures, which makes universal viral genomic extraction difficult. Current studies have tackled these challenges in many different ways employing a wide range of viral concentration and extraction procedures. However, there is limited knowledge of the efficacy and inherent biases associated with these methods in respect to viral sewage metagenomics, hampering the development of this field. By the use of next generation sequencing this study aimed to evaluate the efficiency of four commonly applied viral concentrations techniques (precipitation with polyethylene glycol, organic flocculation with skim milk, monolithic adsorption filtration and glass wool filtration) and extraction methods (Nucleospin RNA XS, QIAamp Viral RNA Mini Kit, NucliSENS® miniMAG®, or PowerViral® Environmental RNA/DNA Isolation Kit) to determine the viriome in a sewage sample. We found a significant influence of concentration and extraction protocols on the detected viriome. The viral richness was largest in samples extracted with QIAamp Viral RNA Mini Kit or PowerViral® Environmental RNA/DNA Isolation Kit. Highest viral specificity were found in samples concentrated by precipitation with polyethylene glycol or extracted with Nucleospin RNA XS. Detection of viral pathogens depended on the method used. These results contribute to the understanding of method associated biases, within the field of viral sewage metagenomics, making evaluation of the current literature easier and helping with the design of future studies.